Good To Begin Well, Better To End Well: The 5th Annual NO KISS Blogfest! The 5th Annual NO KISS Blogfest! You read that correctly, blogfriends! The NO KISS blogfest, as hosted by Ms. Frankie Diane Mallis is coming -- this year, with a small change of hosting venue,* as Frankie is doing ALL THE THINGS (seriously have you seen her course listings because I want to take all her classes please) and neither one of us wanted to see this most excellent of traditions fall by the wayside! Rest assured, however, her vision (and participation!) will remain intact! Your mission on January 2, 2014, should you choose to accept it, is to share that most elusive and satisfying of scenes: the ALMOST KISS! It can be yours, or your favorite from a book you love, or even a scene from a film or television series -- all formats are acceptable, as long as no lips actually lock! Things You Should Do To Prepare For The Ultimate Non-Kissage Festivities! 2) Sign up for the No Kiss Blogfest by filling in the Mr. Linky below. Because Mr. Linky is awesome. 5) Settle in at your computer on January 2 and enjoy the buffet of No-Kisses! and Second, a Clip for you, because that is how it is done-- Pride and Prejudice is a traditionally fantastic choice! Oh, Darcy! So! If you're ready to accept the challenge of the No Kiss Blogfest, Sign ups begin Now! *I know, I know I said I was on Hiatus but the No Kiss Blogfest ALWAYS Supercedes Hiatusing! It's TRADITION! 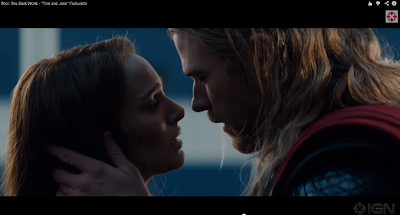 **yes I screencapped this from the Thor and Jane Featurette Marvel put out to promote the movie, which you can watch HERE! I don't think anyone will mind if you autopost while you're away and comment when you get back :) Speaking for myself, Comments are warmly received no matter when they come! Okay. I really want to participate. I love near kissing scenes. I'm not going to be able to participate. I wasn't able to find anything and I've been busy with deadlines and my upcoming promotion. There wasn't enough time to look through my mss. I have kissing scenes, but I couldn't remember where the near kissing scenes were located. I'm sorry to hear this, but I hope you'll be able to participate next year!! We're thrilled to have you! Wouldn't miss it. Happy New Year, everyone! Signed up last year. Signed up this year. It's all good. Love me some no kissy scenes. Now to ponder the best no kiss . . .
Yup! that's all there is to it! Glad to have you! Nice! I'm looking forward to reading lots of examples of heightening romantic/sexual tension, the kind of stuff I like to read and write. And I'm glad to find this blog, as a fellow mythology fangirl. Hooray! I'm always glad to find other Mythology fans! And thanks for signing up!! A Winter's Enchantment and Taming Fate! Holiday Hiatus with Santa Thor!